Dresses are Timothy Heller and Jared Ryan Maldonado. The shy duo on stage are Timothy Heller and Jared Ryan Maldonado and they make up Portland's Dresses. Soft spoken and, I imagine, vegetarians (just kidding...unless they are), they make their music do the talking. Lush-pop that overflows with feels makes me want to run across a field of daisies if I wasn't too allergic to the darn flowers. 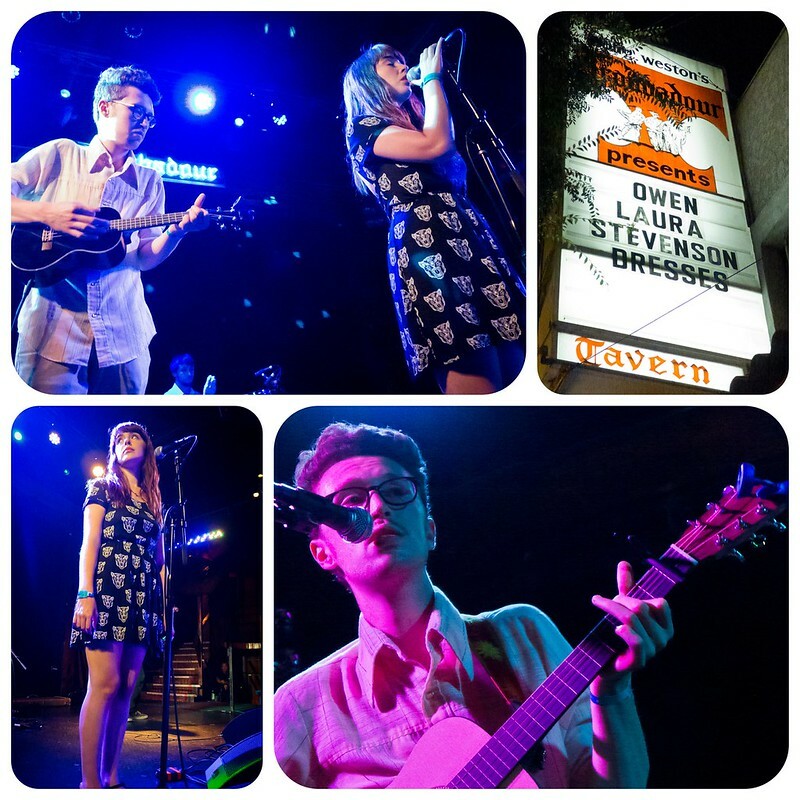 Dresses, this night at The Troubadour, from the outset for their first song, I began to feel the allergic rash as I ran through that field in my mind. But aside from their fresh hooks, it's Timothy's unique playful vocals that is the highlight of this group. Almost playing their new EP Sun Shy in its entirety, their songs, infectious melodies that are sun-kissed by Portland's ever-scarce and rare sunshine. Heck! They're from Portlandia - the land a recent survey called 'The Most Hipster-Friendly City in the Country'. So hipster that the front-woman has a guy's name. And the other? Two first names! Anyways, they're too cool to be my friends and I'm too shy to approach them. So I'll just admire them from afar and wish I was partying with them in their video below! 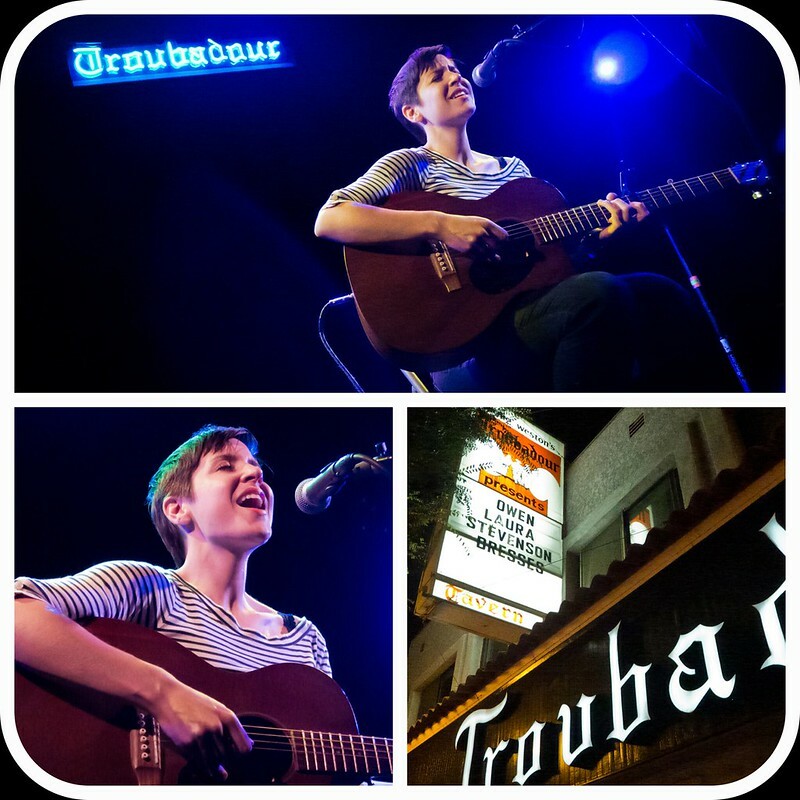 Laura Stevenson performs an acoustic set at The Troubadour. Laura Stevenson came on stage in a new 'do, joking that she resembled Justin Bieber before she dyed her hair a darker color. Sad songs of heartbreak and loneliness peppered her set, played on a bare stage with just her guitar and smooth and powerful voice. (I'd like to see Bieber do that! ). This was my first time seeing her. Loooooved her. Spotifying her right now as I write this. Reminds me of those early Woodstock-era singer/songwriter tunes in the day that my parents always listened too. Laura is an old soul, stuck and finding her way through this industry that's embracing the digital revolution. But it's still great to see artists like Laura still 'plugging' away and still playing music that really means something.